A petition campaign signed by over 70 noted public health experts have been sent to Union Ministries of Health and Family Welfare, Law and Justice and Parliamentary Affairs, appealing them to permanently firewall health policy making from those with a conflict of interest. "In the last two months, we saw few examples of tobacco industry interference in health policy making. 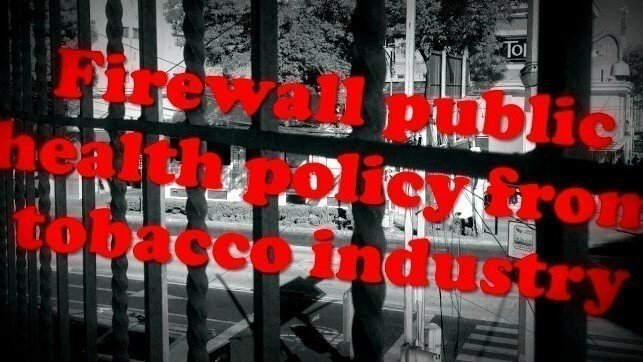 India has ratified the global tobacco treaty (formally called World Health Organization Framework Convention on Tobacco Control - WHO FCTC), Article 5.3 of which clearly states that there is a direct and irreconcilable conflict of interest between tobacco industry and public health policy. India's obligation to WHO FCTC should not be violated" said Rahul Dwivedi of Vote For Health campaign, Asha Parivar. "In March we saw how Parliamentary Committee on Subordinate Legislation had a Member of Parliament who had a tobacco (beedi) business, which when got exposed then Prime Minister had to call for removing conflict of interest from parliamentary committees. Recently we saw the news how Finance Ministry of the government was earlier said to be involved with Asia Pacific Tax Forum organized by Big Tobacco" added Dwivedi. Dr Sandeep Pandey, Magsaysay Awardee and Vice President of Socialist Party (India) said: "Ministry of Health and Family Welfare (MoHFW) should accelerate development and adoption of inter-ministerial code of conduct so that not just MoHFW but all other ministries are protecting health policy making process from tobacco industry interference. Law and Justice Ministry should come up with stronger legal measures that can further firewall health and development policy making from industry interference. Parliamentary Affairs Ministry has been asked as per news by the PM to remove conflict of interest from parliamentary committees. We request the Parliamentary Affairs Ministry to go for long term measures and significantly increase severity of penalty imposed on those Members of Parliament who violate conflict of interest disclosure. At present perhaps such MPs who have conflict of interest are just asked by Speaker to step out of parliamentary committees. This penalty is not enough." Dr Sandeep Pandey added: "Public health is also unduly influenced by other industries such as those of food, drugs and vaccine, and by international agencies who represent these industries. This influence too must end. Public health is too important a subject to be left at the mercy of corporate interests." Such stronger measures to remove those with conflict of interest from health and development policy making will also be in line with India’s obligation to implement the global tobacco treaty (WHO FCTC) and its Article 5.3. "Nothing about us, without us"
"I could have been Mary Jane Veloso"